Warner Bros.' DC Comics Extended Universe is starting to take shape, with Batman v Superman: Dawn of Justice and Suicide Squad currently in post-production, and Wonder Woman recently starting principal photography. 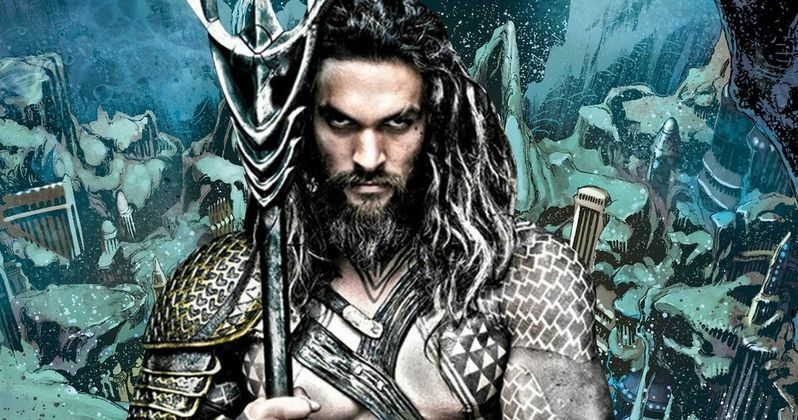 One of the studio's 2018 projects, Aquaman, is coming together nicely as well, with Jason Momoa set to star, James Wan attached to direct, and David Leslie Johnson coming aboard to write the screenplay. No official story details have been released yet, but today we have a new rumor from JoBlo, which reveals who the villain may be, while offering new details about Mera's role in the story. There may be potential SPOILERS below, so read on at your own risk. One of Aquaman's primary villains in the DC Comics is Black Manta, who many assumed would be battling Aquaman in this stand alone movie. This unconfirmed report claims that the villain will actually be Ocean Master, a.k.a. Orm Curry, Aquaman's half-brother. Their rivalry is said to be reminiscent of the brothers' fight for the Throne of Atlantis in the comics. This hasn't been confirmed by Warner Bros., and even if it is true, the villain may change, since producer Charles Roven recently told Collider that work has just begun on the screenplay. Here's what the producer had to say about the Aquaman script. "We're very early days. We're just starting with the screenplay. He's (James Wan) making The Conjuring 2 now, so he's had his hand in the creation of let's just call it a working document from which to write. But he's directing that film [and] he's got his hand ever so slightly in the development, but he's really gonna throw himself into it after he finishes shooting Conjuring 2. And we're planning on it being his film after Conjuring 2. He is a serious Aquaman fan." Earlier this month, another report surfaced that Warner Bros. is looking to cast Mera, Queen of Atlantis and wife of Aquaman, in both Justice League Part 1 and the Aquaman movie. She was described in the previous report as the "Khaleesi of the Sea," with this latest rumor claiming she will be a "force to be reckoned with," and she will be just as much of a hero as her husband. The site compares Mera's role to Charlize Theron's Furiosa in Mad Max: Fury Road, who is involved in just as much of the action as her male counterpart, Tom Hardy's Max Rockatansky. This rumor also claims that the studio is looking to cast a "non-white" actress for Mera, which would line up with with the mixed race Jason Momoa, who is part Native American, Hawaiian and German. In the comics, both Aquaman and Mera were portrayed as caucasian with blonde hair, but it's clear we'll see very different versions of these characters on the big screen. What do you think about these new Aquaman details?